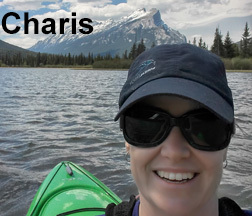 Charis works in the store part-time and instructs in our kayaking and SUP programs. She grew up paddling the warm waters of central Ontario. After close to a decade of guiding in the Algonquin region, Charis decided the next adventure should involve mountains. Charis is convinced there is no such thing as a bad day on the water and that there is some type of paddle sport for everyone. When not at the store or on the water, Charis can be found with a cup of coffee and a camera in hand out exploring Calgary and the surrounding mountains. slowly transferring the rest of her Ontario certifications to the Paddle Canada equivalents.